Wind turbines are the most visible and recognizable “face” of the ever-growing renewable energy market. Far more than just high-tech windmills, wind turbines require precise calibration and control to achieve optimum performance. 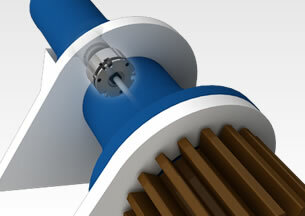 Miki Pulley designs and manufactures a broad range of high precision motion control solutions for wind turbine. 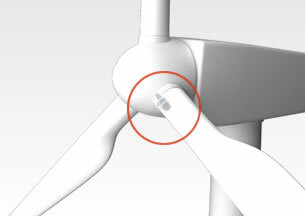 In this example, a Miki Pulley BXW brake helps maintain the blade pitch on a wind turbine. These lightweight brakes are available in three models that are specially designed for braking (L-Type), holding (S-Type), and combination braking/holding (H-Type). All BXW brake models provide high torque in a compact package and are built for long service life, even under heavy use. Designed to function at full torque right out of the box, BXW brake units require no “running in” to season the abrasive elements. Strategically placed springs minimize noise by reducing the clattering sounds caused by small vibrations during high speed rotation. When not energized, these electromagnetic brakes are actuated by the force of springs. Additional BXW sub-models are include those for small servo motors, oversize models, and ultra-slim models. All deliver reliable performance, low noise operation, and high torque capabilities. We can create custom brake units based on standard BXW models to match your unique specifications. Request a quote on shaft brakes, shaft couplings, and shaft clutches for your wind turbine applications. Or, contact Miki Pulley for more information.